For your reference, PM (Particulate Matter), which is also known as Particle Pollution, refers to a mixture of unhealthy solid and liquid droplets in the air. There are two types of PM: PM10 and PM2.5 (the numbers refer to sizes of the diameters of these particulates, in micrometers!). Basically, you don’t typically want PM in your lungs. 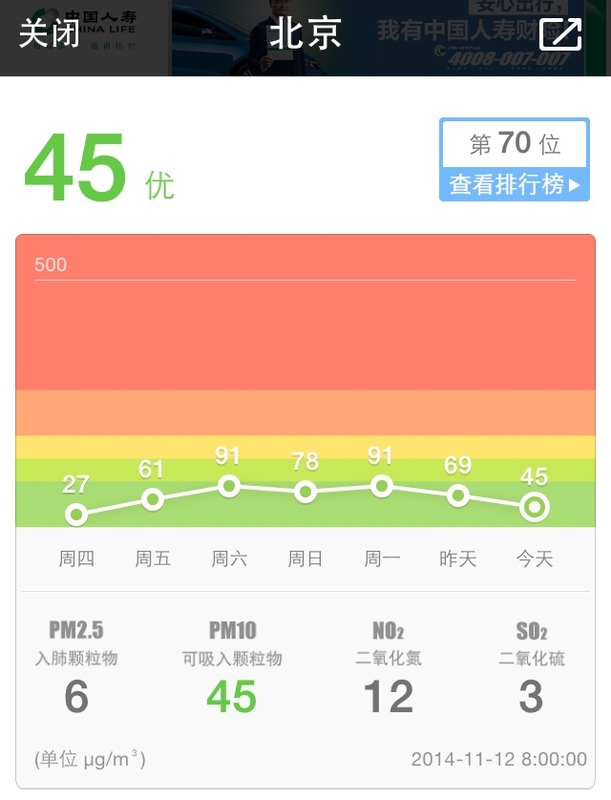 The PM scale is as follows: 0-50 is good, 51-100 moderate, 101-150 unhealthy for sensitive groups, 151-200 unhealthy, 201-300 very unhealthy (which typically includes health warnings of emergency conditions, but not in China), 301+ Hazardous (I’ll leave this one to your imagination). I won’t get into too much detail here. I’ll let the data do the talking. A typical month in Beijing. An ‘APEC Blue’ (you’ll find out more about this later). *This is a snapshot from my phone. During the past week, Beijing has gone through an amazing transformation. Factories in Hebei and all around Beijing were shut-down, and traffic jams suddenly disappeared. Several factors came together well to make Beijing’s streets nice and empty. License plates ending in odd/even number are alternatively restricted. Non-Beijing licenses are prohibited. All trucks and cars who have not met the Euro I emission standard are prohibited from entering the city. Furthermore, everyone in the public sector, government, schools, and SEOs got a surprise vacation (with no salary cuts whatsoever). Several train routes exiting Beijing have been added. Even 大爷(table tennis uncle) took this as an opportunity to go to Shanghai! Its off-season, and a great excuse to escape the city life. Although I’m having a blast, I must mention that some people are being inconvenienced as certain roads have been closed. Some subway lines are also closed due to maintenance work. Most of us also lost 2 days precious weekend days from last weekend and the upcoming weekend, in which we will have make-up classes. A new term has been coined by local social media activists: “APEC Blue” (Defined as something beautiful but surreal, that disappears immediately). For example, “She not actually into you bro, she’s an APEC blue!” On a more serious note, Obama has also made it over to Beijing to experience the APEC blue in person. APEC (Asia-Pacific Economic Cooperation) is a forum which includes 21 member economies, established in 1989. The current leader is from Indonesia. Members account for approximately 40% of the world’s population and 54% of the world’s GDP. China is obviously taking APEC very seriously. Obviously, China is determined to reach their goal of becoming the next global superpower soon, but do you need to take APEC this seriously? ‘APEC Blue’ sends out a powerful message that will resonate deep within the people of Beijing. That message goes something like this: “As you can clearly see (physically speaking), we are capable of controlling the pollution levels. APEC is here so let’s have 7 days of clean weather. Foreign leaders are far more important than tens of millions of you living here in Beijing and actually driving our growth.” Hmm.. the sounds a bit too strong to me. The government cleaned up the weather just a bit too well. Let’s take a look back at history. The industrial revolution is marked as a huge turning point for humanity. Since then, every global superpower (the British Empire, the Soviet Union, and the United States) has gone through a similar stage of a massive increase in production leading to severe pollution. However, due to current technology and an abundance of easily accessible information, people are now aware of this. I’m optimist, though, about new forms of ‘clean energy’ that will revolutionise the future. 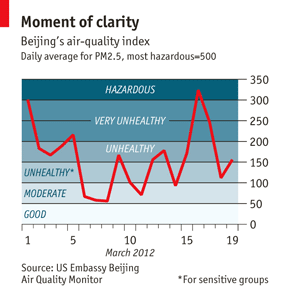 Economists predict that the current state of pollution in Beijing will last for another 20-25 years. As a (self-proclaimed) economist myself, I like to simplify issues by breaking them down. There are numerous factors that can explain why this is happening. Simply put, GDP Growth goes directly against controlling the pollution. Right now, GDP Growth is what its going to be. May any difficulties you’ve been facing recently be APEC blues :). I love Beijing! Where else do you get to experience something like this?